Case in point: Keith Fenton (played by Morris Chestnut), an undeniably successful, attractive and charming attorney. 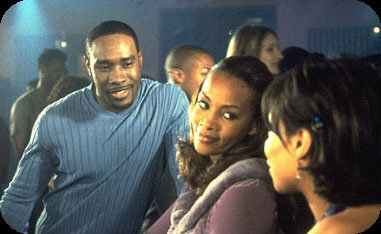 He's the man of one Shante Smith (Vivica A. Fox), a gorgeous, intelligent advertising account executive who certainly seems to be going places. Her confidence and capability in handling men has made her so much the envy of all her friends that they come to her for advice with their own problems with their men. So imagine her surprise when, after getting the call that he is, ahem, "working late," both she and her girlfriends see him out dancing with another woman from his office. But the ever-resourceful Shante doesn't despair. She manages to play it cool in front of the other girls, because she has a ten-day plan to train this dog, and immediately goes about putting it into effect. Such is the premise behind Two Can Play That Game, a simple yet enjoyable little film that seems to reduce love and relationships to a match of wits but, in the end, amounts to a bit more than that. For every move Shante makes, Keith counters, thanks to the wise counsel of fellow player, Tony (Anthony Anderson, who practically steals the show). To convey her viewpoint, Shante breaks the fourth wall frequently to directly address the audience. This device is very effectively used in the film, as it allows the viewer to see Shante's vulnerability and uncertainty, while on the other hand she is the very embodiment of pure confidence and poise when she is with her friends. Without the audience interaction and Fox's charisma, Shante would likely have been a much less sympathetic character. And while Two Can Play That Game is Fox's film to carry, she simply couldn't pull it off without the wonderful supporting cast. The fact that Chestnut is easy on the eyes certainly doesn't hurt any, but he also manages to be quite convincing and funny as his character tries to comprehend the inner workings of the female mind. The aforementioned Anthony Anderson is just hilarious. Shante and his character are truly playing the chess match in the film, and he's especially humorous when he takes any action his "adversary" makes as a personal affront. The trio of Wendy Raquel Robinson, Tamala Jones and Mo'Nique play Shante's best friends, and each one has her own man situation. They do a wonderful job of portraying the insecurities and the small victories women experience while dating, and the interludes where Shante hangs around with and advises her friends are really quite delightful. Had Anderson not already walked away with the show, Mo'Nique might have pulled it off instead. This cast is that good. Bobby Brown also has a brief cameo appearance, and it's a really clever bit of self-parody. The commercials and trailers have emphasized the buck-toothed, oily-haired aspects of his character, but it's really what happens to him as the movie progresses that I found most comical. Connie, our heroine's nemesis (of sorts), is played by Gabrielle Union, and she is a conniving, self-serving "freak" as opposed to Shante, who while also somewhat superficial, essentially is just looking for a good, honest, trustworthy man who can make her happy. This story doesn't exactly break any new ground, but the twist of having the woman be the player makes for some really terrific comedy opportunities, which writer/director Mark Brown (How to Be a Player) has handled deftly. The film moves along at a brisk, carefree pace, and though the plotline is rather predictable, going through the ten-day program with Shante is a blast. Part of what makes it so is that Two Can Play That Game is more than just a simple "revenge of the girlfriend" flick. Shante's ploys don't always necessarily succeed, and in fact, there are times when Keith even gains the upper hand. The real fact of the matter is that some of the things Shante does to teach Keith his lesson are manipulative and a little crappy. The fact that she occasionally gets her own comeuppance keeps her character from becoming unlikable and tiresome. The film's final scene will come as a surprise to no one (this is a romantic comedy, after all), but overall Two Can Play That Game is surely a satisfying treat. Ultimately, it's a movie that may appear on the surface to break love and intimacy down to simple rules, but in the end it shows that rules simply don't work when it comes to affairs of the heart. Thanks to a stellar cast with leads who all play nicely off one another, Two Can Play That Game gets us to that point with plenty of wit and style.